The Good Place received positive reviews upon its debut and has since gained critical acclaim. It has been praised for its acting, writing, originality, setting, and tone. In addition, the first season's twist ending and the show's exploration and creative use of ethics and philosophy have been positively received. The recognition also earned the series a Peabody Award in 2019. Jameela Jamil as Tahani Al-Jamil, a deceased, wealthy philanthropist born in Pakistan, raised in the United Kingdom, and who went to school in France. Tahani, whose full name means "Congratulations Beautiful", is a seemingly good-natured soul with a cheerful and helpful attitude who in life was constantly overshadowed by her younger sister, Kamilah. She died when a statue of her sister at the Rock and Roll Hall of Fame in Cleveland, Ohio, which she was trying to tear down, crushes her. Initially, Eleanor dislikes Tahani, finding her positive attitude, condescending manner, and her tendency to name drop obnoxious, but the two eventually become friends. Carden also plays "Bad Janet", Janet's counterpart from the Bad Place, and "Neutral Janet", who works in the Accountant's Office. Manny Jacinto as Jason Mendoza from Jacksonville, Florida, a deceased amateur DJ, devoted Jacksonville Jaguars fan, and backup dancer who sold fake drugs to college students and died locked in a safe as part of a poorly-thought-out robbery attempt. Jason is immature, easily distracted and only partially aware of what is happening to them. He is first introduced as "Jianyu Li", a supposedly silent Buddhist monk and Tahani's soulmate. After Janet is rebooted in Season 1, Jason develops feelings for her because she is the only one who is nice to him; the two marry, but because his memory is wiped in the season 1 finale, he is unaware of his marriage to Janet until he is told about it in season 2. After being sent back to Earth with no memories of his time in the afterlife, Jason learns about his previous self's marriage again when he accesses Janet's database in "Janet(s)". Jama Williamson as Val, a demon who is also Shawn's secretary and has an obsession with seeing things get tortured. Ben Lawson as Larry Hemsworth, a former boyfriend of Tahani and the fictional brother of the Hemsworth acting family. Despite being a paediatric surgeon, he considers himself unsuccessful in comparison to his brothers. Leslie Grossman as Donna Shellstrop, Eleanor's mother. Her negligent parenting had been used in part by Eleanor as an excuse for her own self-centred behaviour in later life. Believed by Eleanor to be dead, she had faked her death, moved to Nevada and adopted the name "Diana Tremaine" to avoid fulfilling a drunken charity auction bid, subsequently adopting a suburban life with her boyfriend Dave and his daughter Patricia. The first season was released on DVD in region 1 on October 17, 2017, by Shout! Factory. The second season was released on DVD on July 17, 2018. ^ a b c Wansbrough, Aleksandr Andreas (November 8, 2017). "Kantian comedy: the philosophy of The Good Place". The Conversation. Retrieved December 20, 2017. ^ Lombrozo, Tania (October 23, 2017). "The Good Psychology In 'The Good Place'". NPR. Retrieved December 20, 2017. ^ Brogan, Jacob (October 27, 2017). "On The Good Place, Thinking Too Much About How to Be Good Can Send You Straight to Hell". Slate. Retrieved December 20, 2017. ^ Moore, Trent (January 31, 2017). "NBC renews acclaimed fantasy sitcom The Good Place for Season 2". Syfy. Retrieved December 20, 2017. ^ Menta, Anna (October 19, 2017). "How Mike Schur's 'The Good Place' Is Revolutionizing the Sitcom". Newsweek. Retrieved December 20, 2017. ^ Nussbaum, Emily (February 6, 2017). "Dystopia in The Good Place". The New Yorker. Retrieved February 17, 2018. ^ Misra, Sulagna (October 24, 2016). "The Dystopia of Black Mirror, the Utopia of The Good Place". GQ. Retrieved February 17, 2018. ^ a b NBC press release (January 12, 2016). "Ted Danson and Kristen Bell Join Cast of Michael Schur's New NBC Comedy "Good Place"". The Futon Critic. Retrieved February 12, 2016. ^ a b Adams, Erik (September 21, 2017). "The good places: The uncommonly decent TV worlds of Michael Schur". The A.V. Club. Archived from the original on July 28, 2018. ^ a b Marilla Thomas, Leah (September 29, 2016). "The Character Names On 'The Good Place' Could Provide Important Clues". Bustle. Retrieved January 21, 2019. ^ a b Andreeva, Nellie (February 11, 2016). "'Good Place' NBC Comedy Series Casts William Jackson Harper". Deadline Hollywood. Retrieved February 12, 2016. ^ a b Andreeva, Nellie (February 25, 2016). "'Good Place': British Presenter Jameela Jamil Cast in Mike Schur NBC Series". Deadline Hollywood. Retrieved March 12, 2016. ^ a b Scherer, Jenna (February 2, 2018). "How 'The Good Place' Turned Into the Smartest, Funniest Sitcom on TV". Rolling Stone. Archived from the original on July 28, 2018. ^ Romain, Lindsey (January 4, 2019). "Visit Janet's Void from THE GOOD PLACE Thanks to This Live Stream". Nerdist. Retrieved January 5, 2019. ^ a b Andreeva, Nellie (March 14, 2016). "'Good Place': UCB Performer D'Arcy Carden Cast in Mike Schur NBC Series". Deadline Hollywood. Retrieved March 15, 2016. ^ Perkins, Dennis (November 15, 2018). "D'Arcy Carden dazzles as The Good Place drops yet another few narrative bombshells". The A.V. Club. Retrieved November 7, 2018. ^ a b Petski, Denise (March 3, 2016). "'Good Place' NBC Comedy Series Casts Manny Jacinto; Julie Goldman Joins ABC's Weeks/Mackay Project". Deadline Hollywood. Retrieved March 12, 2016. ^ a b Heritage, Stuart (December 8, 2017). "The 50 best TV shows of 2017: No 8 The Good Place". The Guardian. Retrieved July 28, 2018. ^ Blevins, Joe (October 21, 2016). "Adam Scott is ascending into The Good Place for multiple episodes". The A.V. Club. Retrieved September 26, 2017. ^ Rogers, Adam (July 27, 2018). "The Good Place's Podcasters Are Smart Motherforkers". Wired. Retrieved January 8, 2019. ^ "'The Good Place' Season 2 Finale Teased By Newcomer Luke Guldan". International Business Times. September 28, 2017. 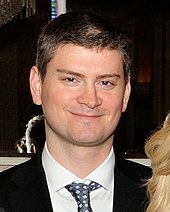 ^ "Michael Schur Returns to NBC with Series Order for Untitled Comedy". The Futon Critic. August 13, 2015. Retrieved April 27, 2017. ^ "Kristen Bell on Twitter". Twitter. January 19, 2017. Retrieved January 24, 2017. ^ Marc Evan Jackson (July 13, 2018). "The Good Place: The Podcast - Chapter Seven: D'Arcy Carden and Megan Amram". Art19 (Podcast). NBC. Event occurs at 6:16. Retrieved July 13, 2018. ^ "NBC Augments Its Stable Schedule with Ambitious New Dramas, High-Concept Comedies and Unpredictable Unscripted Series". The Futon Critic. May 15, 2016. Retrieved January 24, 2017. ^ Ostrow, Joanne (September 15, 2016). "How Will NBC's 'The Good Place' Tackle Religion?". The Hollywood Reporter. Retrieved October 11, 2017. ^ Birnbaum, Debra (August 16, 2016). "'The Good Place' Boss Mike Schur: The Model in My Head is 'Lost'". Variety. Retrieved October 11, 2017. ^ Spendlove, Jacqueline. "With a twist: 'The Good Place' returns after last season's surprise ending". TV Media. Retrieved September 25, 2017. ^ Squires, Bethy (October 25, 2016). "The Refreshing Artifice of 'The Good Place'". Splitsider. Retrieved August 29, 2017. ^ Adams, Eric (September 16, 2016). "Kristen Bell and Ted Danson find a great home in a Good Place". The A.V. Club. Retrieved August 29, 2017. ^ Jensen, Jeff (January 20, 2017). "The Good Place season 1 finale: EW review". Entertainment Weekly. Retrieved August 29, 2017. ^ O'Connell, Michael (June 15, 2016). "NBC Sets Fall Premiere Dates, Gives 'Good Place' a Choice Preview Slot". The Hollywood Reporter. Retrieved October 11, 2017. ^ Ausiello, Michael (July 31, 2017). "NBC Tweaks Fall Rollout: Good Place Gets Early Talent-Boosted Premiere, The Blacklist Return Moved Up". TVLine. Retrieved August 1, 2017. ^ Nemetz, Dave (December 4, 2018). "The Good Place Renewed for Season 4". TVLine. Retrieved December 4, 2018. ^ Lambert, David (September 12, 2017). "The Good Place - Official Studio Press Release for 'The Complete 1st Season'". TVShowsOnDVD.com. Archived from the original on October 11, 2017. Retrieved October 11, 2017. ^ Prange, Stephanie (June 5, 2018). "Season 2 of 'The Good Place' Due on DVD July 17". Media Player News. Retrieved July 15, 2018. ^ Porter, Rick (January 23, 2017). "'The Big Bang Theory' ajdusts up, 'My Kitchen Rules' adjusts down: Thursday final ratings". TV by the Numbers. Retrieved January 23, 2017. ^ de Moraes, Lisa (May 26, 2017). "Final 2016-17 TV Rankings: 'Sunday Night Football' Winning Streak Continues". Deadline.com. Retrieved May 26, 2017. ^ Porter, Rick (September 21, 2017). "America's Got Talent,' 'Big Brother,' 'Masterchef' ajdust up, 'The Good Place' and 'Salvation' adjust down: Wednesday final ratings". TV by the Numbers. Retrieved September 21, 2017. ^ Welch, Alex (January 28, 2019). "'Brooklyn Nine-Nine' and 'The Good Place' adjust down: Thursday final ratings". TV by the Numbers. Retrieved January 28, 2019. ^ "The Good Place: Season 1". Rotten Tomatoes. Fandango Media. Retrieved December 26, 2018. ^ "The Good Place Reviews". Metacritic. CBS Interactive. Retrieved December 26, 2018. ^ Zalben, Alexander (September 16, 2016). "Our 10 Most Anticipated New TV Shows of Fall 2016". TV Guide. Retrieved October 11, 2017. ^ "The Good Place: Season 2". Rotten Tomatoes. Retrieved January 6, 2019. ^ "The Good Place - Season 2 Reviews". Metacritic. Retrieved December 26, 2018. ^ "The Good Place: Season 3". Rotten Tomatoes. Retrieved December 26, 2018. ^ "The Good Place - Season 3 Reviews". Metacritic. Retrieved December 26, 2018. ^ McFarland, Melanie (December 9, 2017). "How-to-be-good TV: "The Good Place"". Salon. Retrieved January 30, 2018. ^ Trendacosta, Katharine (November 5, 2016). "The Complicated Morality of The Good Place". io9. Retrieved January 30, 2018. ^ a b Poniewozik, James (January 31, 2018). "How 'The Good Place' Became an Antihero Antidote". The New York Times. Retrieved July 28, 2018. ^ a b c d Yuko, Elizabeth (October 21, 2017). "How 'The Good Place' Goes Beyond 'The Trolley Problem'". The Atlantic. Retrieved January 30, 2018. ^ a b Street, Andrew P. (January 29, 2018). "The Good Place: How a sitcom made philosophy seem cool". The Guardian. Retrieved January 30, 2018. ^ a b Palumbo, Stephanie (January 25, 2017). "'The Good Place's Optimism Is a Salve for Despair in the Trump Era". Vulture. Archived from the original on July 28, 2018. ^ a b Herman, Alison (November 2, 2017). "Talking to a Philosopher About 'The Good Place'". The Ringer. Retrieved January 30, 2018. ^ Dietz, Jason (December 6, 2016). "Best of 2016: Television Critic Top Ten Lists". Metacritic. Retrieved January 12, 2018. ^ Dietz, Jason (December 4, 2017). "Best of 2017: Television Critic Top Ten Lists". Metacritic. Retrieved January 12, 2018. ^ Prudom, Laura (September 7, 2016). "Critics' Choice Awards Reveal Most Exciting New Series Honorees". Variety. Retrieved October 11, 2017. ^ "Best Comedy Series - Best of 2016 Awards". IGN. 2016. Retrieved October 11, 2017. ^ Lewis, Hilary (December 7, 2017). "AFI Names Top Movies, TV Shows for 2017". The Hollywood Reporter. Retrieved December 12, 2017. ^ Beachum, Chris; Montgomery, Daniel; James Dixon, Marcus (July 26, 2017). "2017 Gold Derby TV Awards nominations: 'This is Us,' 'Veep,' 'The Leftovers,' 'Stranger Things' among top contenders". Gold Derby. Retrieved October 11, 2017. ^ Naoreen, Nuzhat (January 18, 2017). "People's Choice Awards 2017: Full List Of Winners". People's Choice. Archived from the original on February 11, 2018. Retrieved October 11, 2017. ^ Otterson, Joe (June 19, 2017). "'Atlanta,' 'This Is Us,' 'Handmaid's Tale' Lead TCA Awards Nominations". Variety. Retrieved October 11, 2017. ^ a b Liptak, Andrew (August 20, 2018). "Here are the winners of the 2018 Hugo Awards". The Verge. Retrieved August 20, 2018. ^ Macke, Johnni (September 5, 2018). "2018 People's Choice Awards: Complete List of Nominations". E! News. Retrieved October 16, 2018.